This entry was posted in Author Events & Book Signings, Historical Interest, Short Stories and tagged Antler Lodge, Barry Brown, Bill Hannah and the Nightingales, Bill Munro Country Rockets, Bob King, Bolingbroke ABC Hall, Carleton Place Town Hall, CFRA Happy Wanderers, Country Harmony Boys, Country Hoppers, Country Rhythm Kings, Country Rockets, Dave Dennison, Don Cochrane, Don Gilchrist, Fallbrook Orange Hall, Fred Paquin's Orchestra, Fred Ryan, Garry Watt, Jerry Badour and his Westernaires, Joan Ann Jamieson, Joe Brown, Ken Reynolds, Kenny Jackson, Lanark Stanley Lodge, Larry Protheroe, Lawanda Brown, Lee Miller's Orchestra, Lockwood's Orchestra, Lynn Strauff, Maberly Agricultural Hall, Mac Beattie and the Melodiers, Mallen's Melodiers, Marie King, McDonald's Corners Agricultural Hall, Mississippi Ramblers, Mississippi River Boys, Paul Gurry, Perth Town Hall, Rideau Ferry Inn, Riders of the Southern Trails, Ron McMunn and his Country Cousins, Ron Sparling, Symington's Orchestra, Tex Montana Cowboy Band, Top Hats, Tracey Brown, Travelons, Valley Ramblers, Vince Lebeau, Ward Allen, Wemyss Hall, Westport Scott's Ballroom, Wilson Sisters. I was hoping to find more info on the Wemyss Hall as my brother owns it and resides there with his family some history of the place would be interesting. The Wemyss Hall was originally known as the Wemyss Orange Hall, and was the headquarters for the Loyal Orange Lodge # 749. The Loyal Orange Order is a Protestant organization with roots going back in 1795 in Northern Ireland. When I was researching the local halls for my book “Lanark County Connections”, I found references to the Wemyss Hall going back as far as January 16, 1920, when they held a ball, featuring ‘good music’ and the admission charge was $1.00 for men. In an earlier article in “The Perth Courier” dated December 14, 1917, the Wemyss Orange Order reported that they held their meeting in a ‘room’, which would indicate that the hall was built sometime between December 1917 and January 1920. The hall was active in the local social scene from that time forward, with many dances and gatherings being held throughout the 1920s, 30s, 40s and 50s. Many gatherings were organized by the Ladies’ Auxiliary known as the ‘Ladies Orange Benevolent Association’ in order to raise money for local charities. Many area clubs such as the Junior Farmers and the Excelsior Club held their dances at the Wemyss Hall. Some of the founding families of Wemyss were: Tysick, Dowdall, Gamble, Scott, Truelove, McFarlane, Kirkham, Cameron, Donaldson, Palmer, Chaplin, Cavanagh, Larmon, Patterson, and Fournier. I hope that helps a bit with your research Jen. I would recommend that you contact the Canadian Orange Order for more details about the establishment of their lodge in Wemyss. You could also visit or contact the Archives Lanark – info@archiveslanark.ca or post a query with the Lanark County Genealogical Society in their newsletter – inquiries7@bell.net, and they may be able to help as well. Good luck! Lloyd Wilson played Antler Lodge. Any relation ? Hello – Although there are lots of talented musicians in our Wilson family, I don’t believe any of them played at Antler Lodge. Do you know the names of the other musicians that may have played with Lloyd Wilson? Hello Rose – You could contact the Lanark County Genealogical Society and they will be able to help – https://lanarkgenealogy.com/. You could also contact the Archives Lanark – http://archiveslanark.ca/index.php – they have lots of information on local buildings. Lovely article that brings back a lot of memories. Another hall used was the Watson’s Corners community hall which is still used today as a community hall. One of the artists who played at the hall was Loyld Wilson during the seventies when I lived in the Village. Have heard a lot of the local Artist’s listed and it is a very impressive list of local talent. One other hall, but from a little earlier era is the White hall located on highway 511 at the junction of (what is now called) Campbell Road. I remember my parents going there and seeing the hall when I lived at Joe’s Lake. Would be interesting if there is any information or pictures of it. Thanks Everett. I’m glad you enjoyed the article. 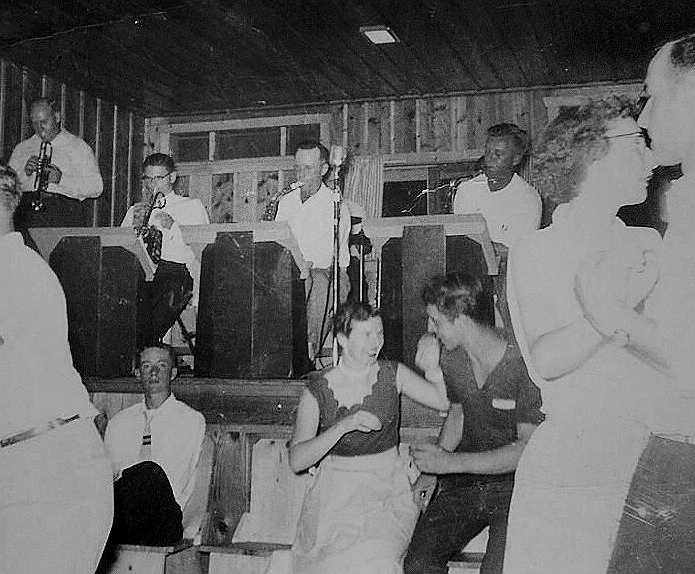 Thanks also for sharing your memories of the Watson’s Corners dance hall, and the White Hall. I hadn’t heard of the White Hall before so nice to have some new history. I wonder if it was named after one of the local families from the area? I would love to post a photo if anyone has one. Jerry Lobbe is another local artist who played for over 40 years. His bands were listed in newspapers I found from the 50’s up. He was inducted into the Ottawa Valley Country Music Hall of Fame but safly he passed away 3 weeks before the induction ceremony. Jerry and the Aristocrats, worked with The Happy Wanderers and Family Brown, he used to play for the Jerry Lewis Telethon and at the Firemen’s Christmas Ball at the Chateau Laurier and NAC in Ottawa). He was very active in the Ottawa-Renfrew region for years, I believe he was married at that little brich church in Galetta and was friends with many folks listed here. It is nice to see the old names again, thank you! There is a story he would tell of him and Paul Anka. When Paul was around 12 he would hang out at his uncles bar and watch the shows. Older Jerry played there and would invite Paul on stage to sing with him, sensing the boy’s keeness. He encouraged music and melody in everyone, an outgoing man, he could make anyone smile, a true gentleman of his time. Music was his life, he played nearly every night since he was a teen, up until the night he passed away. It truly was all about the music until the day he died. It may be bittersweet but at least he knew he was honored for his contribution, not just granted posthumously – great really. He deserved it and more. Hello Lulu – Thanks so much for sharing your memories of Jerry Lobbe. It’s very sad that he passed away before his induction to the Ottawa Valley Country Music Hall of Fame. Many thanks also for sharing the story of Jerry Lobbe and Paul Anka. What a treasure for him to have had an influence on Paul at such a young age. Thanks for stopping by!